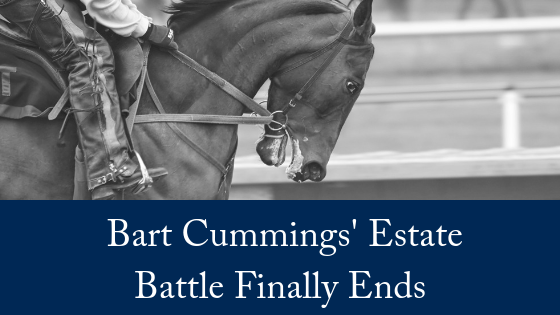 The end is in sight for the family members locked in a bitter estate battle over the racehorse trainer Bart Cummings’ estate. in 2016, the New South Wales Supreme Court heard that two proceedings have been launched challenging Cummings’ will – one by his daughter Sharon Robinson together with her mother Valmae, and one by son Anthony and another of his sisters, Margaret. Both sides are challenging the division of the Cummings assets, worth millions of dollars. In a short hearing, Justice Francois Kunc, ordered the families to enter mediation. Valmae Cummings, who is in poor health and being cared for at the family farm west of Sydney, wants mediation to occur as soon as possible, the court heard. 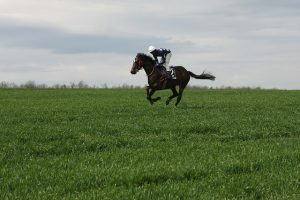 But the court was told Anthony Cummings, who is also a racehorse trainer, was not in a position to give instructions to his lawyer for several weeks due to the Flemington carnival. The executor of Cummings’ estate, Aaron Ross Randell, was a defendant in the court action. Mr Randell is a partner at accountancy and financial planning firm Emerson Randell Young. Cummings was made a member of the Order of Australia in 1982 for his services to the racing industry, and in 1991 was inducted into the Sport Australia Hall of Fame. He was also awarded the Centennial medal in 2000, carried the Olympic torch down the Flemington Straight and was inducted into the Racing Hall of Fame in 2001. The trainer won the Melbourne Cup 12 times, earning him the nickname the “Cups King”. Some two years later, the long-running estate battle between Cummings’s children and the executor of his estate, accountant Aaron Randell, has been ­settled privately, days before it was due to go to an extended hearing in the NSW Supreme Court. In a case that involved the sale of Princes Farm, a 55ha property at the foot of the Blue Mountains in Sydney’s west, a judge made orders involving Anthony Cummings, Sharon Robinson and Margaret McDonald-Cavanagh late last week. This week, the three were due to battle it out in a trial before judge Philip Hallen, having tried mediation with lawyers several times. Each sibling had commenced separate legal action in late 2016 against Mr Randell, co-founder of the firm Emerson Randell Young. Cummings’s widow, Valmae Mary Cummings, was also part of the legal dispute and reportedly had sided with her daughters, but died before the matter was settled. Racing NSW last month announced it had bought Princes Farm, the birthplace of Melbourne Cup-winning racehorse Saintly and stakes winners Curved Ball and Flying Pegasus. Details remain confidential but it is thought the property sold for about $15 million. At the most recent court date before this week’s trial, Judge Hallen asked all parties to set out an agreed schedule of assets and liabilities in Cummings’s estate. He also asked each legal team to provide an estimate of its total costs. Whether any provision you have already received is adequate for your proper maintenance, education and advancement in life. Competing claims of other eligible persons or beneficiaries. You may not be the only person who was cut out of the will. The nature and duration of your relationship with the person who has passed away. The size of the estate. For example, you may pass all the criteria to make a successful family provision claim, but if there is only $20,000.00 in the estate, then there is very little scope for a Court to order provision. The financial circumstances of people you cohabit with, such as your spouse or de facto. Contributions you made, both financial and non-financial, to the person who has passed away. Any provision the deceased person made for you during their lifetime. The area of law surrounding family provision claims is complex. Advice should always be sought urgently as there are tight time frames. In Queensland, you only have 9 months from the date of death and notification must be made within 6 months from date of death. For further information about contesting a will, please contact our expert team today. We offer a FREE, 10-minute phone consultation.